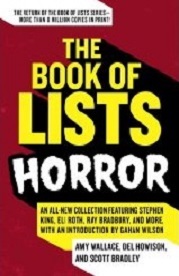 Purchase "The Book of Lists: Horror"
My contribution to this volume was the "Top Ten List of Scariest Pulp Magazine Covers." My selections are below but to read my ranking and rationalization, you'll have to acquire the book. No reviews except that a few readers noted that it would have been nice if my illustrations had been printed in color by the publisher. For that reason, the covers are presented below. Here are the top ten images, in no certain order.